This recipe was a happy accident. I was running around the house like a nutjob trying to get everything done before friends rocked up for dinner – clear bombsite, wash felt tip beard/moustache off my daughter (she did it to herself, not I), chisel porridge and spaghetti sauce off wall etc. Then I thought, oh bugger, we don’t have any nibbles. I can’t do dinner for friends without snacks, because we always take a long time pfaffing around doing the barbecue, and you can’t have people going pie-eyed on booze without something to line the stomach. I get really antsy if there’s nothing to fill the gap, and I have a pathological love of crisps. So I rootled around in the freezer, found a bag of frozen peas and thought I’d make a dip. And, unlike a lot of my thrown-together-at-last minute experiments, it bloody worked and was surprisingly nice! It’s sweet, but salty and lemony with a really fresh taste. Just make sure you defrost the peas thoroughly first, which I didn’t have time to do, otherwise you’ll be eating a sort of tasty pea sorbet. It’s really summery, perfect for this time of year, and takes five minutes to throw together. This is delicious served with another favourite of mine, pitta chips with z’ataar, a variation on a recipe I found on Chocolate & Zucchini. A bit more exciting than plain salted tortilla chips, which at the moment seem to form one of my five-a-day. 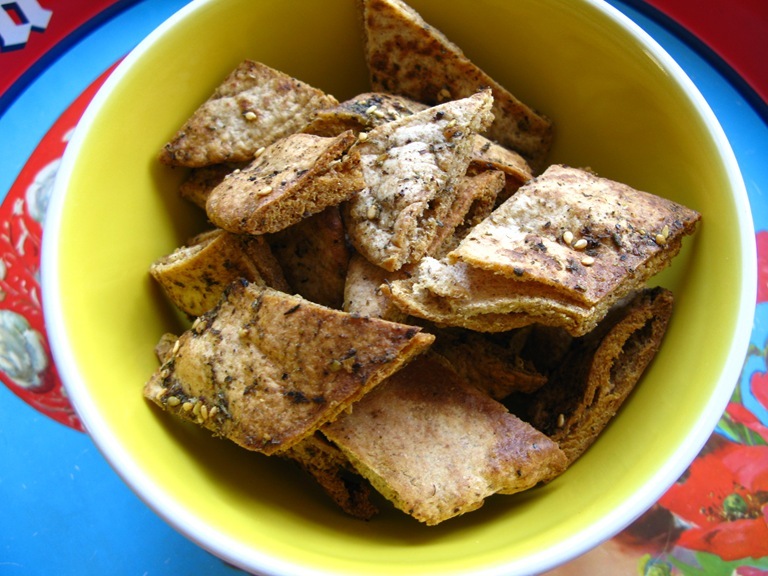 Salt and pepper – check that your Za’atar mix doesn’t already have salt added; mine did so I didn’t need the extra. First of all, prepare your pitta chips. Preheat your oven to 150C, roughly cut up the pitta breads into small, fat rectangles, put in an oven tray. Pull some of them apart so that you get extra thin crispy bits, and leave some of the bits as double layers, as these ones will be nice and chewy. Sprinkle liberally with olive oil and za’atar spice, mix around and repeat so that everything is covered. Put in the oven for 10 – 15 mins to crisp up, tossing halfway through to ensure everything browns evenly. 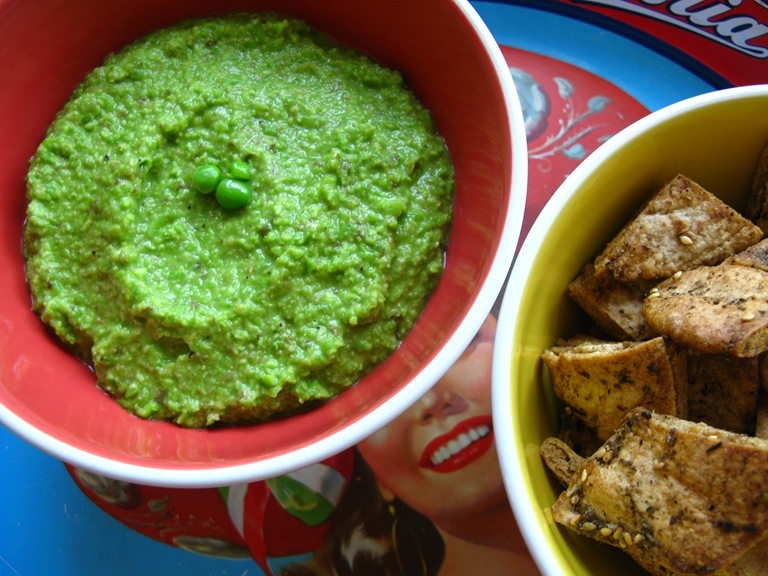 While the pitta chips are cooking, make the pea dip. Put all the ingredients in a food processor (or use a stick blender) and whiz up until the dip is looking creamy. Serve immediately with the chips and a nice cool glass of pink plonk. Have you also tried my smoky butterbean dip? It’s really moreish and would go well with the pea one, if you needed a MEDLEY of dips. 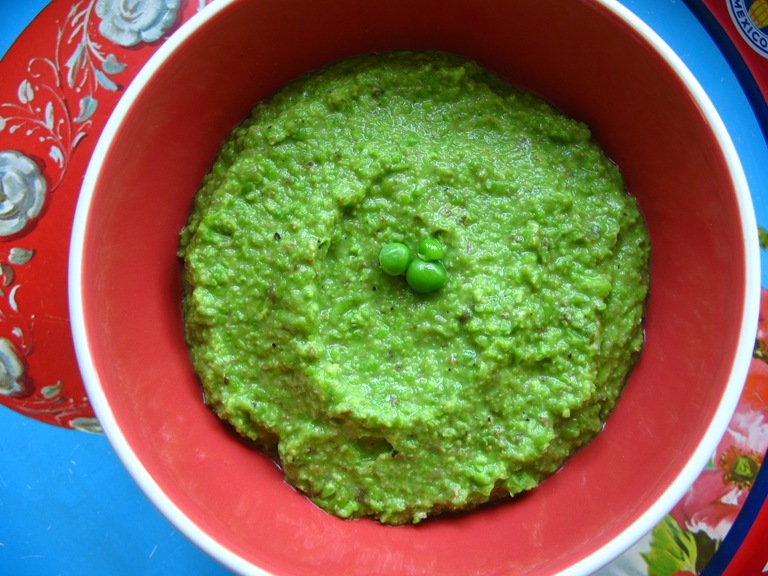 This pea dip is something I would never have thought of, but sounds like an amazing flavour combo. I love frozen peas – they can be such a saviour. I have that same tray shown in your photo!